Shooting Guns provide the perfect soundtrack for the morning after the apocalypse, when you are sitting in the rubble of your home in a bathrobe and think, ‘What should I do now?’ and end up zoning out for hours in a psychedelic trance instead of making a survival plan. Bad move on your part, because you are probably going to die. Canadian sextet Shooting Guns is known (and oft-nominated) for their film soundtrack work, but Flavour Country is more like a collection of anthems for your jettison from this universe into the multiverse. While they’re known for heavy and saturated sounds befitting crazed horror-comedy flicks like Netflix hit WolfCop, Flavour Country features some of the band’s fastest, heaviest and most visceral material to date. Yet, it also features some of the band’s most atmospheric sounds as well. At times there are slight hints of Ennio Morricone’s Spaghetti Western twang amidst the looping Meddle-era Pink Floyd heavy psych and driving drone reminiscent of Bobby Beausoleil’s belladonna laced soundtrack to Kenneth Anger’s Lucifer Rising. But for the most part here, Shooting Guns is out for blood, regardless of tempo. Album opener “Ride Free” kicks off with a blistering wall of guitars blaring and rattling out of the gate like mutant progeny to fellow Canadian biker-rock heroes Steppenwolf having duly fired all of the guns, exploded into space and returned to hunt down every last one of us. It accelerates from there: “French Safe” sounds like an unhinged battalion of musicians driving full throttle like a scene from a George Miller Road Warrior movie. Biting, lengthier tracks like “Simian Shelf” and the title track occupy the heavy end of the psychedelic spectrum, haunting the foggy moor between early, bluesy Sabbath-styled doom riffery and heavy pulse-riding kraut-rock. Flavour Country is the first album recorded by the band themselves at their own Pre-Rock Studios in Saskatoon, SK, located in the middle of the Canadian prairies. The album title’s spelling is itself a nod to the band’s Great White North homeland. The album was mastered by John McBain (ex-Monster Magnet, Carlton Melton), who also mastered the band’s previous RidingEasy releases. 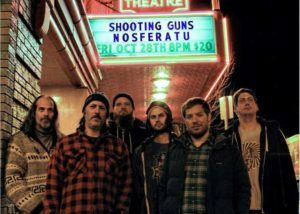 Shooting Guns have toured over 60,000 miles across Canada over the past 7 years but have yet to tour Internationally, which will be a big focus for them after this release. They are touring their live score to F.W. Murnau’s Nosferatu across Canada throughout 2017 and also just finished scoring the soundtrack to Another WolfCop (sequel to WolfCop), which is slated for a US theatrical release in Sept 2017. Their sophomore LP, Brotherhood of the Ram, released in 2013 through RidingEasy Records was nominated for the 2015 JUNO Metal/Hard Album of the Year as well as the Polaris Music Prize. Their debut LP, Born To Deal in Magic: 1952-1976, was also nominated for the Polaris Music Prize in 2012.